When you're just learning to sew, choosing the appropriate machine can become overwhelming. You'll come across electronic machines, computerized machines and in some cases, mechanical machines. Some machines will have a number of features, most of which you won't need unless you decide to take your sewing to the next level and learn a specialized skill such as machine embroidery or machine quilting. Look for a machine with basic features. 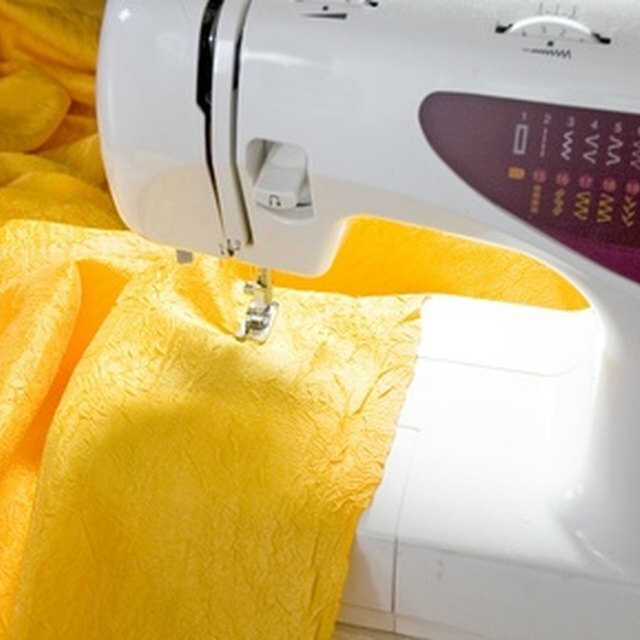 A good beginner's sewing machine only needs a few features. It should have a straight stitch option as well as a zig-zag stitch. You should be able to adjust the stitch's length and width as well as the tension. Ideally, the machine will come with a zipper foot and a button-hole foot. The machine should also have a reverse function. If you plan on sewing garments, a free-arm on the machine is a must so that you can sew sleeves and waistbands. Three main types of sewing machine are available. A mechanical machine is the most simple and the most inexpensive. You select the stitch style and length on a mechanical machine by adjusting knobs. An electronic machine is a little more complicated, as the stitch style and length is adjusted by electrical sensors. You'll probably get more precision out of an electrical machine. Unless you plan on machine embroidery or sewing complicated stitches from the start, you will not need a computerized machine as a beginner. Computerized machines are usually cost-prohibitive for the beginner, as they usually cost upward of $1,000. Before you buy a machine, take it for a test-run. This means you may not want to buy a sewing machine online. Head to a sewing machine dealer and practice threading the machine and winding the bobbin. If you feel stymied by threading, ask for help, and don't buy the machine if you feel absolutely confused by it. Sew a line of straight stitches to see how they look and to get a feel for the machine. Listen to the machine as you sew. If it sounds unpleasant or too loud, keep shopping. Flip through the manual to make sure it is clearly written and that you can understand the directions. You may not want to put down the money for a new sewing machine, especially if you are not sure your new sewing hobby will stick. A used machine may be a great option for a beginner, provided it has been well-cared for by its previous owner. Always see the machine in person before buying to make sure it hasn't been dented or otherwise damaged. Sew a few test stitches to make sure it still runs correctly. Check the machine thoroughly to make sure all the pieces are still intact. It should come with the appropriate accessories, including a zipper and buttonhole foot. What Is a Stitch Finger on a Sewing Machine? How do I Repair a Baby Lock Sewing Machine?